Special thanks to photographer, Paul Saraceno for collaborating on these images! 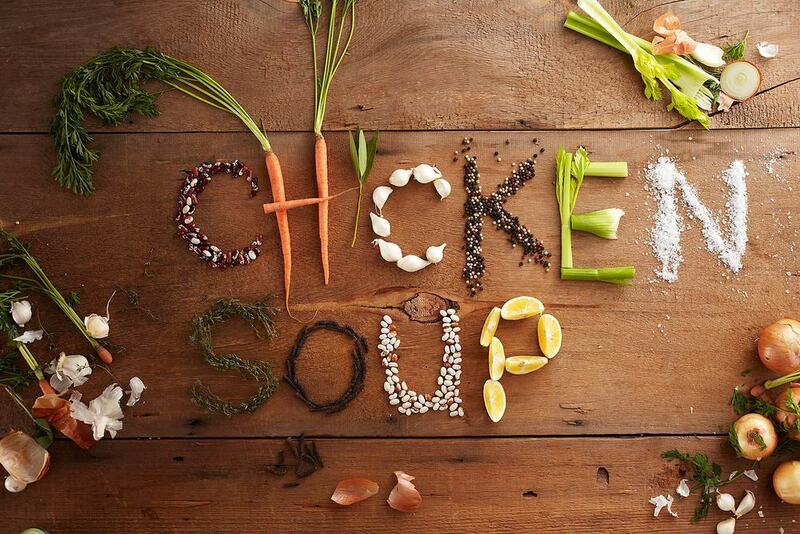 Chicken soup is the most comforting soup, is it not? I usually buy my whole chickens at Whole Foods. They are frequently on sale for $1.99/pound and so a whole chicken costs me less than 5 bucks and I can get several delicious meals out of it. When they are on sale, I usually buy 3 chickens at a time and put 2 of them in my freezer to roast or make more soup out of later. The third bird can be used immediately to make soup (see recipe below). You can also choose to roast the chicken for dinner and use the carcass and leftover meat the next day to make the soup. First, you will need to make the chicken stock using the whole chicken or leftover carcass. Then you will add the final ingredients to the stock to make this hearty soup. How to Make Chicken Stock: Place the whole bird into a stock pot and cover the carcass with water. Add in all other ingredients and bring the stock to a boil. Let this simmer for about 25 minutes. Remove the bird from the pot and place on a parchment lined tray to let cool. Meanwhile, using a fine mesh sieve, drain your stock into a bowl and discard the veggies in the compost (by this time they are soggy and lack virtually any flavour - after all that simmering their delicious flavour has been imparted to the stock). Remove the meat from the carcass using your hands and set this meat aside. Finally, make the soup (! ): Pour the stock back into your rinsed pot. Add your diced veggies and bring your soup to a boil, then back to a simmer. Add your leftover chicken meat only at the end of the cooking to prevent it from becoming overcooked, tough and chewy. If you want to add more veggies to your soup, you can toss in some peas or kale at the end. Serve your soup with fresh baked bread and butter for a hearty, comforting meal.